You can set up the PDF export settings for a selected panel. This panel will be exported with all the others, but will follow its own rules. In the Workspace toolbar, click the PDF View button to switch to the PDF View workspace. Select Windows > Panel PDF Options to display the view in your current workspace. In the Thumbnails view, select one or more panels. Exports the selected panel. This option is enabled by default. Deselect this option if you do not want to export this particular panel. Starts panel on a new page. Prints panel on a full page. Lets you set the maximum image height for a full page panel. Applies to landscape orientation only. 0 = No Limit. Displays camera motion (such as pan, tilt, or zoom) in the image across several panels. Size, in percentage, that the panel will appear within its frame. This option is enabled by default. All captions from this panel will be exported to PDF. If you want to select specific captions to export, deselect this option and use the Caption List option to make your selections. This option is unavailable when the Export All Captions option is enabled. When available, click the Browse button to open the List Picker for selecting specific captions to export. Adapts the box to the text and spreads it across the next panel if necessary. When this option is deselected, caption text is cut if it is too long or big for the space available in the box. Select the scale, in percentage, the text will appear in the captions of this panel. Shrinks captions if they do not fit in the panel. Exports the sketch caption field of this panel. 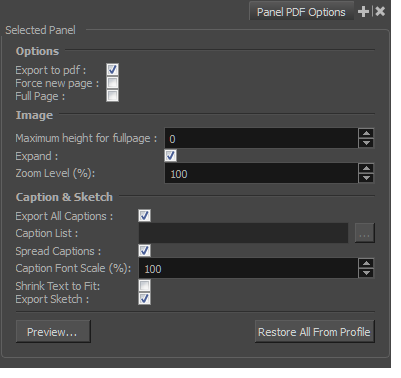 Creates a quick PDF of the page containing the selected panel(s), using the current default PDF export profile for the other panels. Returns the options to the current default PDF export profile. Click Preview to create a quick pdf preview of the page containing the selected panel(s), using the current default pdf export profile for the other panels. Click Restore All from Profile to reset the options to the current default pdf export profile.